If you think you’ve seen unusual theatre then think again, because The Tiger Lillies latest show (a concert style costumed Brechtian ballad based on the plays of Frank Wedekind) will change your perception of a five star show forever! The first thing you notice when the curtain rises is the empty stage, decked out with only a piano, drum set and a saw. The lighting is pale and low, casting shadows over the faces of the actors, who are already in position at their assorted instruments. There is a beat, and the lead singer, costumed in a scruffy costume suggestive of period dress steps forward towards a microphone located dead centre stage. He pauses, looks around at the terrified theatre-goers, exhales into the mic, a long, scratchy breath, and the piece begins. Before long, it is apparent that the piece’s unusual nature is not for everyone. There is a heavy Brechtian influence, with the actors creating sound effects on stage, addressing the audience and using projections to suggest location. 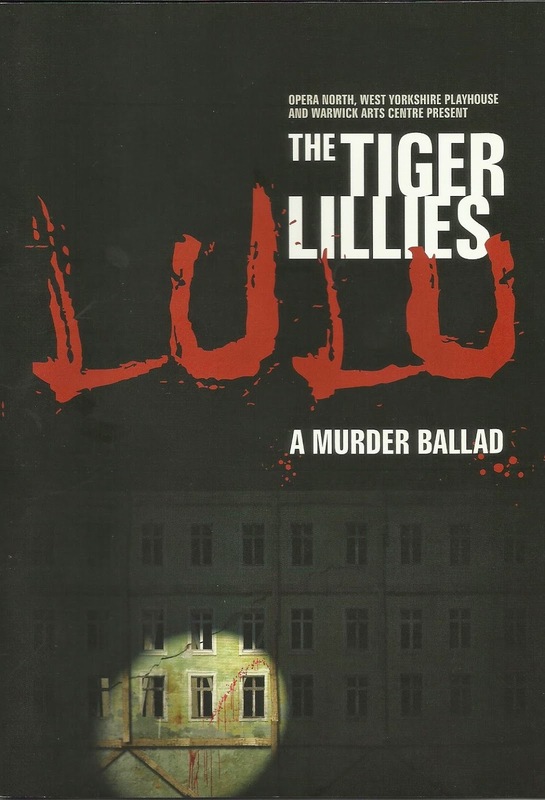 It is less of a play, or musical, and more of an extended monologue set to music and accompanied by a single dancer, representing Lulu through a combination of ballet and jazz dance. To some extent it could even be likened to a rock concert, though, it is certainly unlike any you are likely to see again. Unsurprisingly, several audience members left in the first act, but possibly before they’d given it a chance. Once you get past the oddball staging and haunting falsetto vocals which contrast the gruff, vile appearance of the actor/ musicians, the piece takes on a life of its own and you find yourself transported to Victorian London, where misdeeds take place in the shady slums, wives beat their husbands and murders stalk the streets, looking for prey. This is certainly not your average night out at the theatre! You’ll come out confused, scared and disgusted, but believe me when I say you’ll not see anything else like this!